At TPM, what we love is that we get to provide our cloud and hosting customers with marketing expertise that will allow them to grow their businesses, turning leads into long-lasting customer relationships. Whether we are with a client or at a networking event, we get asked a great deal about what we feel is the secret formula to cloud marketing success. Is it a company’s ability to create an emotional connection to the customer through brand? Is it the ability to deliver a memorable website design paired with optimal website performance? Or is it a company’s delivery of intelligent content that engages its readers, turning leads into sales? Although all aspects contribute considerably to the overall success of a company, there is no secret formula, per se. So we decided that this common query deserves a six-part blog series, which we will call – The Six Strategies for Cloud Marketing Success. The six-part series will cover topics including: Design, Content SEO, Performance SEO, Organic Content Development, Lead Nurturing and Understanding Buyer Personas. Our first blog of the series is Emotional Web Design: Creating a Connection. Your logo and website design says everything about your brand and your company. Your website design is usually the first representation of your company and may determine if that potential customer will stay – or leave your website. Have you ever searched for a particular product or service and clicked on the first link that comes up, only to be directed to a website that, once you are on it, you can’t leave fast enough? How likely will you be to purchase from this website? Compare how that website made you feel with how you felt when you visited a site with impeccable design. How do you feel when you visit a site that utilizes all visually appealing elements of color, font, logo design and Web design? By utilizing these elements, companies are able to create an emotional connection with their customers. Can you recall seeing a brand or visiting a website that evoked an emotional connection with you? How likely are you to do business with this company? Did you know that 50% percent of every buying decision is driven by emotion? Does your company’s website design evoke an emotional connection with your potential buyers? Does your branding clearly speak to your buyer personas and do you tap into emotional branding to attract potential buyers? If you are unfamiliar with the term, Wikipedia defines emotional branding as the practice of building brands that appeal directly to a consumer’s emotional state, needs and aspirations. Emotional branding is successful when it triggers an emotional response in the consumer — that is, a desire for the advertised brand (or product) that cannot fully be rationalized. Wikipedia also gives three examples of companies that succeed at emotional branding: Kodak, Jim Beam and McDonald’s. Whether or not you have an emotional connection to any of these brands, there probably is a brand that you can admit a loyal, emotionally connected bond to. The average consumer mentions brands 90 times/week with family, friends and co-workers. When you think of brands that succeed at Branding 101, companies like Apple, Starbucks, Nike and Coca-Cola may come to mind. These brands have successfully tugged at our emotional heart strings, establishing life-long brand loyalty with customers and, as a result, have become very successful and profitable. How can a brand create an emotional connection that will result in profits? An attractive Web design is nice, but does it really impact your bottom line? Sixty-one percent of consumers consider buying a brand, product or service recommended by a brand advocate. Ninety-two percent of people trust recommendations from people they personally know! Let’s use Apple as an example. Because Apple has established an emotional connection with its customers, Apple users have become the brand’s biggest brand advocates. How many times a day to you see the Apple logo? Brand advocates will promote your product for you. Because Apple has established an emotional connection with its customers, Apple users have become the brand’s biggest brand advocates. Three of the most powerful social media companies—Facebook, Twitter and LinkedIn—never spent a dime on advertising or paid people to recommend them. They didn’t need to. Advocates used social media to recommend them to their friends. Nine out of ten online consumers say recommendations from friends and family members are the most trusted form of advertising worldwide. Only about two out of ten trust online ads. How Do You Ensure that Your Branding and Website Design Emotionally Connects with Your Existing and Potential Customers? Your brand should be a representation of your company, your corporate values and your employees. Your website design should be a reflection of your brand and connect with your customers on a personal level, becoming an important part of their lives. Design a representation of the quality that your brand represents, which consumers will come to love and trust. Emotional Web design should include the essence of both the brand and the company. How can we take what we have learned outside our industry to build an emotional connection between our brand and our customers in the cloud and hosting industry? Is your website a good indication of what your company stands for? Is it evident what your value proposition is just by looking at your site? Does your website reflect your brand identity? Is it apparent what your company’s key differentiator is just by looking at the design of your website? Is your website an extension of your business, its culture and your employees? Think about what you want your customers to come away with. Does your website design convey your corporate values? If your value proposition is of trust, does your website represent that? We get busy with our day-to-day routines, which is why it’s important to take a step back to see if what we think we are communicating with our customers is what they are actually taking away from our branding and website. If you don’t have a strong value proposition and brand identity, sit down and figure out what your company and brand stand for. What is your corporate mission statement? What personality should your brand convey? Research your audience. Who are they and what are they looking for? Identify your buyer personas — who is buying your product and services and what appeals to them. Will your branding and website design appeal to your buyer personas? You need to know your brand first, before you can assess how you want to be portrayed in the industry. To ensure an effective emotional Web design, make sure to identify your buyer persona first. What is their demographic information (i.e., gender, marital status, household income, age, child status, geographic locale)? What do they do in their spare time, with whom and how? What are theirs issues that they need solved? How can your company solve their problems? Where do your personas get their information (website, magazine ad, and/or social media)? How can you best market and communicate with your buyer personas? Does your brand and website design speak to said personas, motivating them to purchase from you? Customers overwhelmingly choose brands that match their personal values (87%) and avoid those that do not (71%). Build a brand that appeals directly to the emotional state, needs and aspirations of your buyer personas. If you build an emotional connection with a potential life-long customer, it’s harder for other providers to compete. Nike is a good example of when emotion trumps everything else. There’s no doubt that Nike’s competition can build a similar product, but let’s face it, no one can come close to matching the impact that the “swoosh” makes with its customers and the public at large. Find out how you can have an impact on your customers and be the “swoosh” of the cloud and hosting industry. Once you have an idea of what your brand should stand for, you can start to build on it, reflecting the different branding elements that will emotionally connect with your buyer personas. What elements of design determine the emotional impact that your site will have on someone– positively or negatively? Logo – Is your logo reflective of your brand and does your entire website reflect the style of your logo and brand? Color – Does your website color scheme reflect your brand and company? Typography – How will your type be arranged to make it visually appealing to the audience? Things to consider include: typefaces, size, line length and line spacing. Layout – How much white space will there be on your site? Less is more! Photography – What photos are needed and do they represent the look you are going for? Graphics – Do you require the use of graphics and are they a good representation of your brand? Content – Is your content clean, clear and concise? Again, less is more. For starters, the basic color of your logo can greatly impact how your brand is received. This infographic is a great representation of well-known brands and how the color of their logos can have an impact on their emotional triggers. 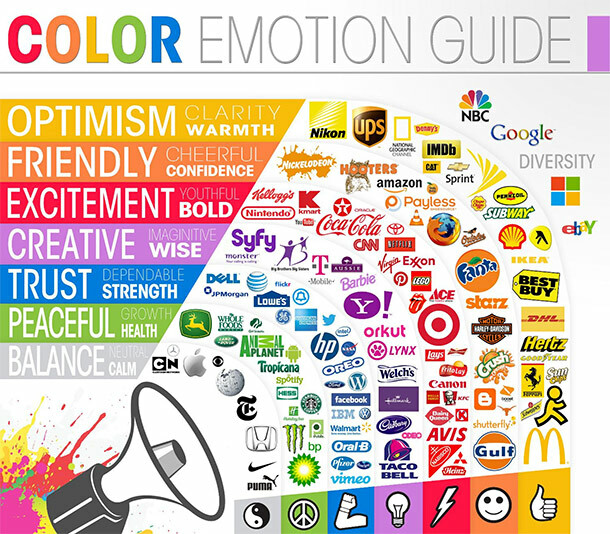 Simply put, does your logo and color scheme evoke the emotion you wish to trigger with your audience? Once you have developed your branding elements, it’s important to get feedback on your branding and web design concept from a focus group or from your employees before delving into Web design. What may look good to you and your agency may not always create an emotional connection with your target audience. If you are a global company, ensure that you test your branding with people in different geographical locations to ensure that it will go over well in all areas. If you have a marketing department, they can gather feedback from employees through contests, polls and lunch-and-learns. Especially if you are doing a re-design, this will help get your employees onboard. Invest in your design – you get what you pay for. Immerse yourself in the market, keep up on trends and stay away from fads. Research the competition – don’t be a copycat, be individual. Keep your logo, branding and website design simplistic. As mentioned, this will also help in future-proofing. Think of some of the greatest brands, their websites and what they all have in common: a clean, minimalist approach combined with aesthetic appeal. Need I say more? Apple: possibly the experts in simple design. Documenting your brand is extremely important if you want to ensure consistency across your site and all platforms. Identify the voice, tone and personality of your brand to keep messaging consistent and relevant. Document font types, sizes and how much white space should appear around your logo and on your website. To work towards an emotional connection with your buyer personas, it’s imperative that you create consistent branding across your website and anything that will have your logo on it. And as always, if you have questions or need help with emotional web design, contact us! We’d love to answer any questions you may have about working with Total Product Marketing.